We've been keeping up with Riley and friends for a season and a half now, and today it hit me. Just like we're having the Fangirl Awards, I should probably give you a "best of" for this show. It's kind of like a "further reasons to watch" post, a companion piece to my first GMW post. I know, it should probably be "Riley, duh! ", but my favorite is still Farkle Minkus. Although I love seeing Farkle and Lucas hang out, if I'm going with my heart, this one goes to the girls. I think it's a mix of them reminding me of Cory & Shawn and of just everything I've seen in this show. In one of the latest episodes Riley said they were like sisters, and I can totally see that! They know everything about each other, even the bad bits, and yet they will always have each other's back. Even when it means putting their own feelings and such aside... if it makes the other happy, they'll do it. I can't wait to see what further adventures life has for these two! I know there are several OTPs flying around when this show is concerned, but I guess for now I'll have to go with the standard first in-canon couple... Riley and Lucas. They just bring out the best in each other, and I love how they can always talk to each other about what matters to them. 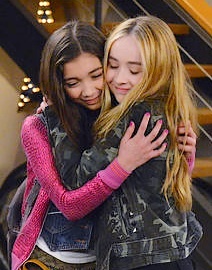 There are probably lots, but I guess the whole "who's the best friendship" (Cory and Shawn vs Riley and Maya) one from "Girl Meets Home for the Holidays"? It just made me laugh and brought my two favorite* BFF pairs from childhood and adulthood together. Can it be a three way tie? c) "Girl Meets Farkle's Choice"
Oh, wow... there were a lot of great episodes this season so far. But probably the two closest to my heart (for very different reasons) are "Girl Meets Creativity" and "Girl Meets I Am Farkle". I'd choose between them, but I couldn't possibly. One reflects a problem that could have impacted me if I was born later than I was (choir was a huge part of my life growing up). And the other reflects a disorder that I might have (Asperger's Syndrome), so to choose between them would be the hardest choice yet! But I'm probably not the only one watching this show. Do you agree with my favorites list? Or do you have different opinions? If so, let me know what your favorites are below!